Hubert Horatio Humphrey, 1911-1978. Vice President of the United States; Senator from Minnesota. 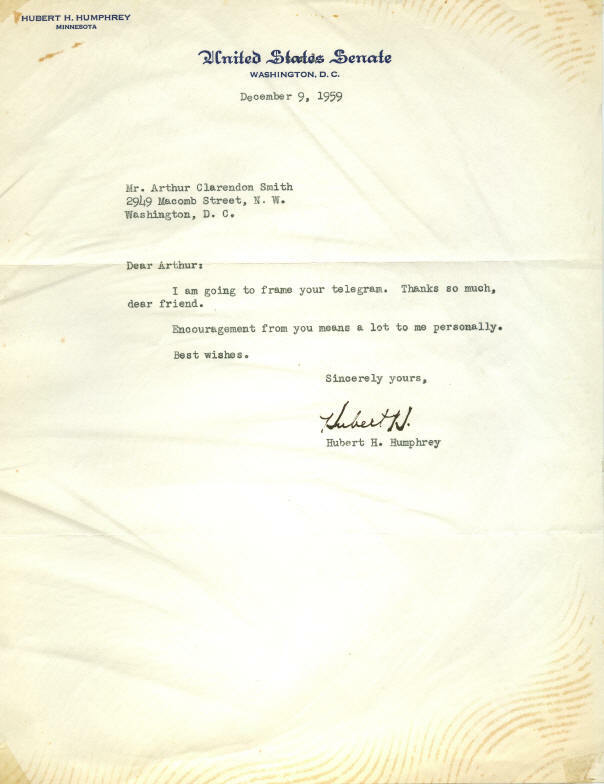 Typed Letter Signed, Hubert H., one page, 8" x 10½", December 9, 1959, on stationery of the United States Senate, Washington, D.C.
Humphrey writes to thank Arthur Clarendon Smith to thank him for a telegram, perhaps encouraging Humphrey to seek the White House in 1960. In part: “I am going to frame your telegram. Thanks so much, dear friend. / Encouragement from you means a lot to me personally." For nearly 30 years Humphrey helped define the ideals of liberalism in American politics. As mayor of Minneapolis, he led the movement for a strong civil rights plank in the Democratic party platform in 1948. His stirring speech at the 1948 convention held to make him a national figure. He was elected to the United States Senate that year. Humphrey served two stints in the Senate, 1949-1965 and 1971-1978. An effective legislator, he championed bills on civil rights, fair employment, the Peace Corps, arms limitation, organized labor, and agriculture. Humphrey sought but did not gain the 1960 Democratic presidential nomination. He was elected vice president in Lyndon B. Johnson’s landslide victory in 1964 and served one term, 1965-1969. He received the Democratic presidential nomination in 1968 but lost the election to Richard M. Nixon. 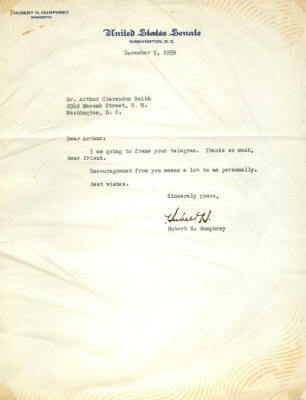 This letter shows the personal side of a giant of post-World War II American liberalism. It has normal mailing folds. It also has wrinkles and stains from prior improper mounting, however, and is priced accordingly. Overall the letter is in good condition.